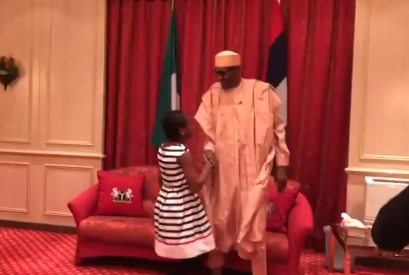 President Buhari meets 12 year old girl that donated her lunch money for his campaign in 2015, others – Royal Times of Nigeria. President Buhari today met with three of his young supporters. One of them is 12 years old Nicole Benson who donated her lunch money for his campaign in 2015. He also met 10-year-old Aisha who wrote him a letter asking to see him. President Buhari also granted audienec to three years old, daughter of popular comedian White Nigerian, who did a 10-seconds video wishing him speedy recovery while he was in the UK on medical vacation. Took aboki almost three years to realize the power and role of the innocent.